Review: Saxon Math – Happy. Homeschooling. Housewife. The math program that we use is Saxon Math. 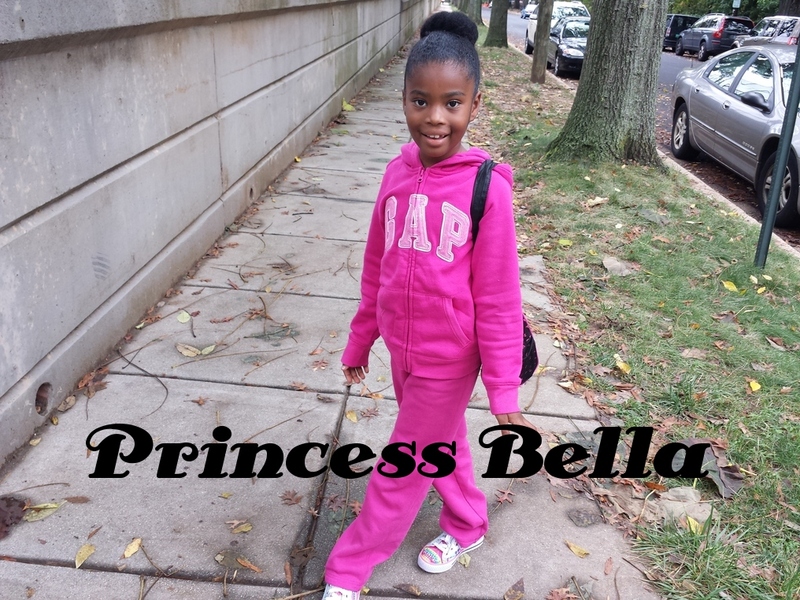 Princess Bella just finished the 2nd Grade book and is ready to move on to book three, the 3rd grade book. I give this program 5 Olive Trees!!!! Saxon math was develop by John Saxon. To learn more about the man himself and his motivations for creating such a program click here. Saxon books are skill-level books, not grade-level books. Saxon math is an integrated math program and it is very systematic (as I believe every math program should be). It is essential that each student be placed in the text that meets his or her skill level. It is highly recommended that you use the complete Saxon program — one book compliments and flows right into the other. Saxon begins with Kindergarten, Level K, and then is followed by Levels 1, 2 and 3. If your child is starting Saxon after Kindergarten it is recommended that you give your child a Saxon Placement Test. Below is a chart that shows the higher levels of the program. The Kindergarten book comes with the Teacher’s Manual and Student Calendar. All activities are huddled around the calendar. The teacher’s manual begins with an overview of the home study program which provides a brief note behind the philosophy of the program and materials you will need. The Table of Contents shows at a glance the skills your child will learn during the course of study. Following the Table of Contents is the List of Materials needed broken up by lessons. Each lesson’s instructions are bound together in a pretty thick Teacher’s Manual. And although it is spiral bound, it does hold up–even after years of wear and tear. The teacher’s manuals I currently use are over have been used by the girl’s four older cousins! Each lesson is numbered and has the title, and thus objective, front and center. Right under the lesson’s title is a box detailing the materials you will need to complete the lesson and any preparation suggestions. The first part o the lesson is called theMeeting. The phrase so stuck with Princess Bella when she started Kindergarten that we still refer to school time as ‘meeting time’. During the Meeting time your children will complete calendar activities in their student meeting book. During this time they go over the days of the week, months of the year, practice counting, and work on patterns. The Lesson focuses on a particular task, such as “Showing Time t the Hour. In Kindergarten the lessons are fairly short and involve the children engaging a variety of manipulatives including teddy bear counters ad pattern blocks. As the levels increase the lessons becoming longer and much more complex. There are also assessments which are spread out to help gage your child’s understanding and mastery of content. 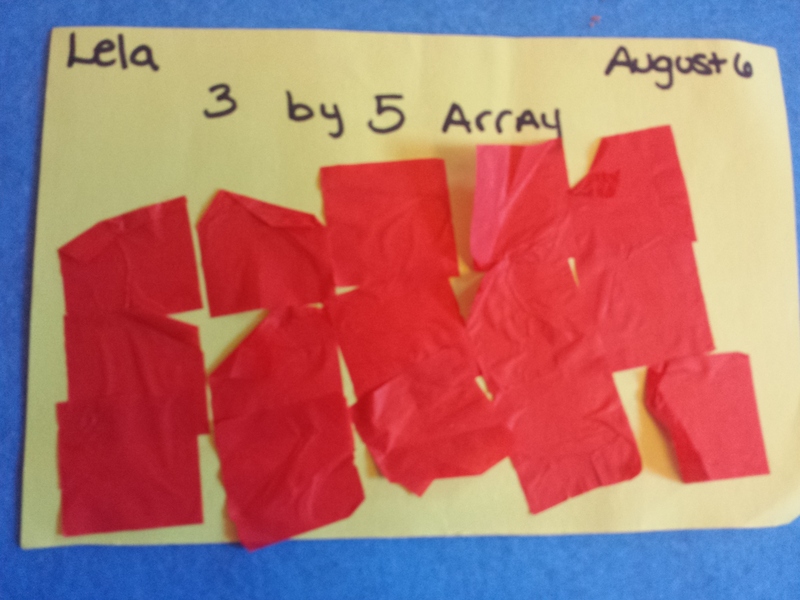 In Kindergarten, the assessments are oral where you child is asked to do a task such as count backwards from time and demonstrate something, such as an AB pattern. In the upper levels, assessments happen every 5th and 10th lesson and include both oral and written exercises. Included for parent use are helpful record keeping forms that allow you to keep track of your child’s scores. In the 1st grade books and up, your Saxon Math program includes a student workbook, work sheets, and flashcards (2nd grade +). So in addition to the meeting work which allows your child daily practice concepts such as counting money, telling time, complex patterns and word problems, they also start daily fact drills and worksheets. The daily fact drills review the new facts learned. The student worksheet are double sided, A and B. Students are always practicing new skills and reviewing old. Once a child reaches Level 5/4 (sometime around 4th grade), you can use the instructional DVD to teach the lessons. I am waiting that day! The DVDs provide real classroom instruction by an experienced Saxon math teacher. The instructor has taught using John Saxon’s math books for more than a dozen years. NOTE: The DVD’s can be used in either a television or computer DVD player. All of the older Village 8 Kids use the DVDs and love it. They enjoy the fact they can take their math anywhere (coffee shop, grandma’s house, Botanical Gardens, etc.) and do math. I also have sat and taken a couple lessons with the DVD math instructor–I think she is pretty great! For starters, I want to put out their that my experience of Saxon is that either people love it or hate it and I think that is based on a lot of different things. What I am convinced of is that this program, if used correctly, will give your child a solid math foundation. I was introduced to Saxon via my nieces and nephew, who are also homeschooled. My sister, Cherie and her best friend, Pam and I homeschool together and we pretty much consult about curriculum choices because we do pass materials down to the younger children. It also helps us speak the same language. My three girls are the youngest of the Village 8 Kids, a term we so affectionately call our brood of homeschooling kids, and the ages range from 19 all the way to 2!. Cherie and Pam studied this program a lot before purchasing it. We rely heavily on Pam’s background (she is an ER doctor) to help guide us in our math and science program and Cherie, well, she is our resident researcher (the article about Saxon himself was prepared by Cherie). So when the two of them picked the Saxon program I felt pretty confident that it was solid. It was very helpful for me to see the program in action (almost on a daily basis) because math is not my strongest subject. Here is a picture of our Village! Ok, so how do I use it? For starters, Saxon, like every curriculum or book, dvd, or website is a resource. It is not the end all and be all and I make it work for my needs. Saxon suggests starting towards the end of August but we actually start the second week of September. We school year round and actually are on break during the time that the program suggest you start. This is absolutely fine because the only thing that is effected is the holiday themed lessons throughout and it is easy to make that adjustments. With this program, I believe you have to be very careful how you adjust the program. This year Princess Bella will be in doing Saxon 3 and Princess Petals will be doing Saxon K. Due to the fact I have multiples, I do the “The Meeting” with all three girls (we can’t leave out little Miss Princess Jubilee!). I purchased a big wall Circle Time Calendar and we do all the calendar activities together and in an active way. The girls may count hopping like a bunny or jumping like a frog. We check the weather and decide which clothes would be appropriate for the day and dress to our doll in (my girls love this). Of course we go over the date and sing the months of the year and days of the week and review our Telling Time Clock. For my Kindergarten this sums up her meeting time. For Princess Bella, she completes the rest of her meeting work — called her meeting strip — on her own. Doing it this way is an example of how I make the program my own and fit our ‘right now needs’. The girls really enjoy coming together and practicing all of this. Because we are learning Spanish I rotate between doing meetings in English and Spanish–this adds to the overall experience. For the lesson part of the program, I pretty much follow the script, and I for one am thankful for such a well thought out script because like I said before, I am not a math person. So I have to it pretty closely. I find that the lessons are engaging and offer a variety of ways for my girls to engage the skills (orally, visually and with whole body movement). The order of the lessons are very predicable so you quickly can fall into the Saxon rhythm — this is also helpful. 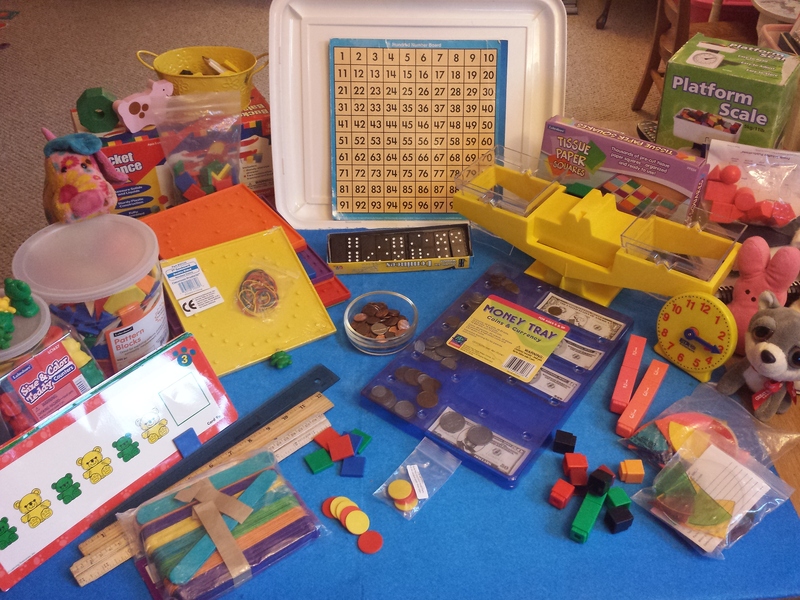 Here is a look at my math manipulatives — they really help the girls have fun learning! During the week I will add different things to the lessons. For example, when Princess Petals was learning about AB patterns we spent that week coming up with different patterns and she loved it. This is another way how I adjust the program. One year when Princess Bella was learning about different graphs, we had her poll the family about their favorite Thanksgiving dessert and she shared her result at Thanksgiving that year ( my mom’s coconut custard pie won hands down!). When it comes to the drills and the worksheets, I follow the Saxon process. I do record the results on the template they provide as it provides a quick glance how she is doing and what skills she needs to work on. As far as the worksheets, we always do side A together with me really teaching and explaining things along the way and correcting thought processes. Side B she does later during her independent time and I grade that sheet and go over any mistakes she made. We do study facts everyday and I strongly suggest it. I have an index box and I have about 20 facts divided by the days of the week. She studies the the right bundle of cards based on the day of the week, and then later she is drilled by an adult or older cousin. This system takes minutes but does wonders! This is also an addition to the program. Oh, I also make our own cards as I am not a fan of the ones they provide. In addition to their worksheets, I pull in other things to reinforce skills and concepts such as Khan Academy and other worksheets but these are only meant to reinforce learning. Overall I am very satisfied with the program. I find it thorough–there are no gaps. It is also accessible, especially for parents who are not as confident teaching math. I learn right alongside my girls and that is a ton of fun for me. It is also effective–it works! Along with being very affordable. If you have any questions please feel free to contact me. Also, if you use (or used) Saxon Math, I would love to learn about your experience in the comments section below. Thanks Traci, and great idea about having a second copy for someone who can explain I will be doing that! Pingback: 2014 -2105 Curriculum | Happy. Homeschooling. Housewife. Pingback: Math Manipulatives That Help Make Math FUN! | Happy. Homeschooling. Housewife. Pingback: A Fun Way to Compare Numbers 1-10 | Happy. Homeschooling. Housewife. Pingback: Adding with Shapes: Today’s Math Center | Happy. Homeschooling. Housewife. Pingback: Morning Math Challenges | Happy. Homeschooling. Housewife. Pingback: Niara’s 2nd Grade Curriculum: 2016~2017 – Happy. Homeschooling. Housewife.